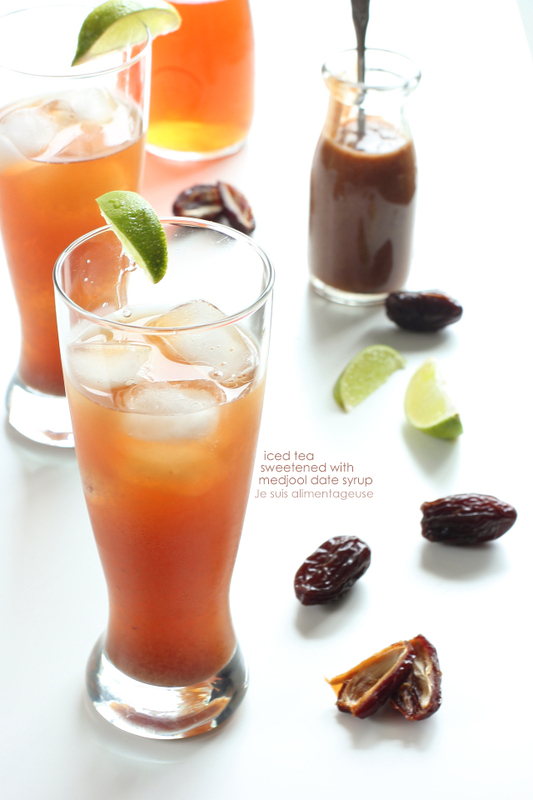 Cool down this summer with iced teaÂ sweetened with Medjool date syrup. I’m not good at summer. I don’t like tanning because I get blotchy and my tan is sort of a weird dark yellow-grey colour. Not my best look. So in order to not tan, I wear long sleeves or when that’s not possible because it’s bloody hot outside, I wear 45 SPF sunscreen. The smell, the slick feeling, the tacky feeling at the end of the day left on your skin that’s a combination of sweat, sunscreen, and outside-world grime. Let’s just say that I like sweater weather. But there are definitely things I love about summer. Pretty dresses, beaches, flip flops, patios for sangria and when it’s not socially acceptable to be drinking (aka early morning brunch) iced tea. I love iced tea. Except for super sweet iced tea, y’know, the stuff you drink that’s so cloyingly sweet you get a weird sugar film on the inside of your mouth. The only way to temporarily get rid of it is to drink more, but it just adds to the problem. 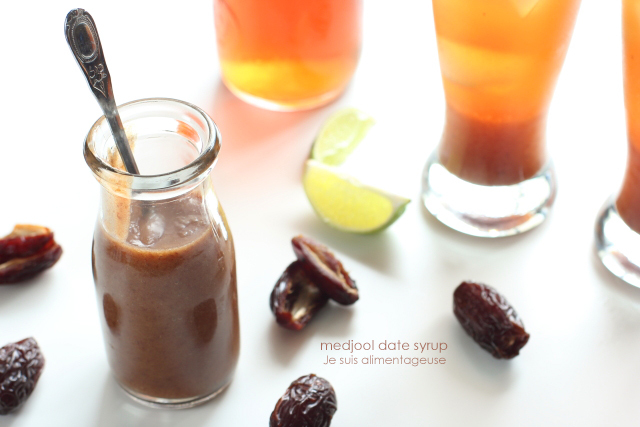 I’m trying to avoid eating too much added sugar so my new favourite way to sweeten things naturally is with Medjool date syrup. 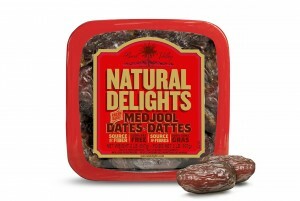 Most of my friends and family know my love-affair with Medjool dates. Literally the softest, sweetest and most delectable date there is. I constantly tell my friends that they’re nature’s caramels, so much so that when I replaced the caramel in caramel clusters with dates, a couple of my friends couldn’t say Medjool dates without saying that they’re nature’s caramels (I’m talking about you, Michael). Those caramel clusters are a dangerous thing because you’ll find yourself eating the entire batch, but hey, don’t feel too guiltyÂ about it because Medjools are full of potassium and fibre…right? But date syrup can be used more than just for sweetening drinks. It’s less a syrup and more a thick and runny date paste that’s great on pancakes, waffles, toast… basically places I’d put syrup but this is better for you. The fibre allows your body to digest it a little slower so your blood sugar doesn’t spike as much as it would with other types of liquid sweeteners. So slather on the sunscreen, don a hat with some sunglasses (UV protection, yo), put your feet up andÂ add this to your iced tea and sip away knowing that you’re doing your body some good. 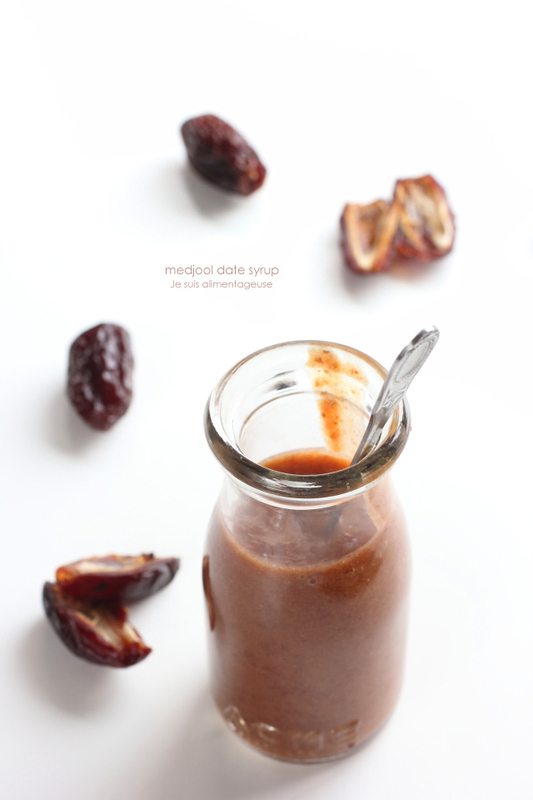 Soak the medjool dates overnight (6-8 hours) in 1 cup boiled water (room temp). Transfer to a food processor or blender and process until thin and runny. Transfer to a sterilized jar or container and use within a week. 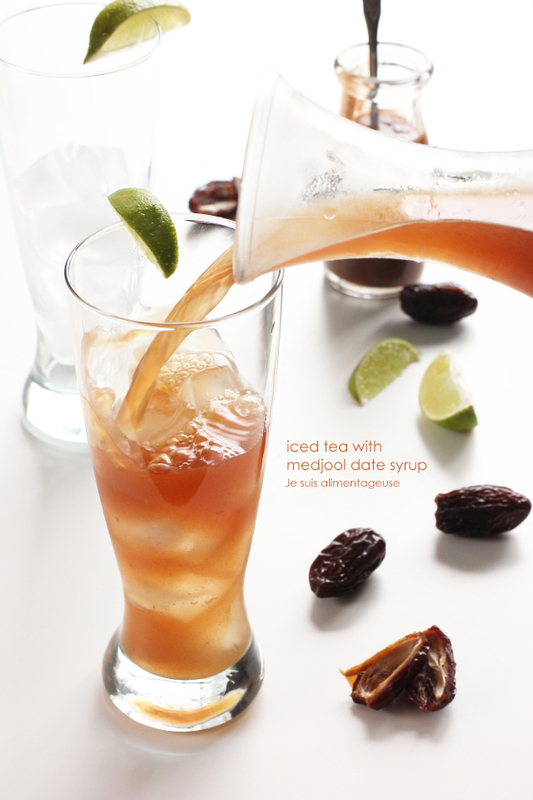 To sweeten your iced tea, add desired amount. I used about 1 heaping tbsp per glass, but if you like your tea sweeter, add more. Make sure to stir before drinking or else the date fibre will settle at the bottom and you'll get a mouthful of sweet date purÃ©e at the bottom of your glass. Also great on pancakes, toast, crackers, and can be used to sweeten baked goods as well. Disclaimer: This post is sponsored by Natural Delights!